There are various manners in which health supplements are delivered, such as pills, tablets, soft gels, liquid form and so on. 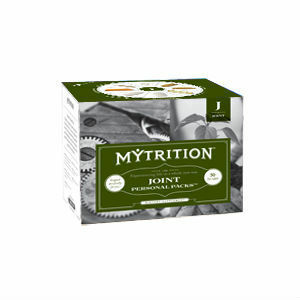 Mytrition Joint Personal Pack is special in its own way, as it provides the user with a packet containing vitamins, minerals and other essential ingredients for joint health. Tablets, capsules and soft gels are included with each packet, to ensure that your joints are well taken care of. As far as the list of ingredients is concerned, Mytrition Joint Personal Pack looks like a thorough, reliable product, so we decided to review it here so you can make an informed decision as a buyer. What Does Mytrition Joint Personal Pack Contain? As you can see, there are many ingredients included in this formula, especially the ones that are known to promote joint health, such as glucosamine, chondroitin and MSM. The presence of herbal remedies like turmeric and boswellia serrata is also commendable. What we did not see, however, is the inclusion of hyaluronic acid, necessary for improving the synovial liquid that keeps joints flexible, even as we age. According to the label, Mytrition Joint Personal Pack must be taken one packet daily, with a meal. 30 packets are priced at 39.99USD, and it represents one month supply. The company selling Mytrition Joint Personal Pack online offers 30 days money back guarantee. Mytrition Joint Personal Pack is probably one of the richest in ingredients product we have seen so far. With the right combination of glucosamine, chondroitin and MSM, completed by herbal remedies, vitamins and minerals, it may be very effective for treating joint pains. However, it does not contain hyaluronic acid, and you need to take a lot of capsules, tablets and soft gels at one time. Mark Stevens	reviewed Mytrition Joint	on December 3rd	 and gave it a rating of 2.